Okay, let's talk about what we have total (not just vinyl like the other thread thing). The reason I'm curious is because I went overboard in the best way over the past couple weeks and finally got around to buying physical CD copies of everything pre-Legacy off eBay and Discogs. I was a little late to the game (my first exposure to JE was Hello, Mannequin, and that was back in '05 I think) so I didn't explore the earlier stuff until much later when a friend of mine gave it to me digitally, but now I own physical copies of pretty much everything (I even scored a Songs & Stories and Rainbow Rider, as well as a Starcadia FINALLY) so I wanna hear what you all have! Hmm. The rarities...this is always fun to think about. I believe I've seen promo versions of Robot Rock and maybe Land of Misfits. They're not really any different other than slightly different artwork and the CDs say promo or something. 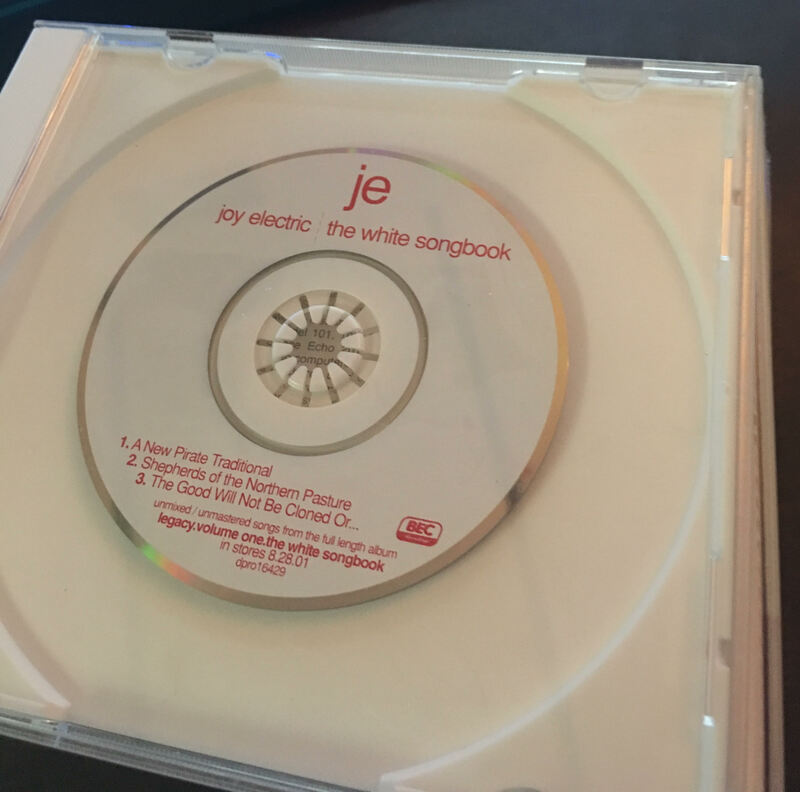 Quite a bit rarer are the "pre-mastered" CDs that came out before The White Songbook. I say "pre-mastered" because I feel like they basically sound the same as the final album versions. Anyway, I think Tooth and Nail had these up for order early. I remember buying a 3" CD that had "A New Pirate Traditional", "Shepherds of the Northern Pasture" and "The Good Will Not Be Cloned". The story of these pre-mastered CDs gets stranger, though, because I feel like only a few years ago I discovered that there were a couple other versions circulating. I'll have to look when I get home. david wrote: Hmm. The rarities...this is always fun to think about. I believe I've seen promo versions of Robot Rock and maybe Land of Misfits. They're not really any different other than slightly different artwork and the CDs say promo or something. I also have that 3" CD. There was also a full-size CD version with (I presume) the same three songs. A demo of "Cloned" floated around Napster before TWS came out, very different from the "un-mastered" / album version. In some ways I prefer the demo to the album version. Dang, I gotta get my hands on one of those. How are the other two demos? Are they drastically different? This is wild. So gritty compared to the full lush version on TWS. Thanks for posting it! This is very cool, thank you for posting @david! Yes, incredibly cool! Thank you! david wrote: As far as I can tell, the songs don't really sound any different than the album versions, despite the CDs claiming that they are "unmixed/unmastered". Maybe I just have a bad ear, though. They do sound pretty much just like the album versions. There is probably some miniscule difference, something that got turned up or down in mastering or mixing, but I could never tell. Christiansongs (which I happened to find at a Goodwill next to the church I grew up in), Picturebook, Their Variables, & Curiosities and Such are the only physical JE media I own; I also have 2 shirts and I used to have the posters for the latter 2 CDs I mentioned. I have been trying to build a complete digital Ronnie collection of sorts on Google Play Music by hunting down all the remixes and covers he did for other artists along with his multiple side projects: norway's first album, Foxglove Hunt, Brothers Martin, etc. All I'm missing at this point, I think, is Dance House Children, Rainbow Rider, the Shepherd album and some miscellaneous rarities like March of the Toy Drums and an alternate version of Electric Car. If anyone wants to trade, let me know!